the ads on my sites. There is no cost increase to the buyer. I appreciate you using my ads to make purchases, if you see something of interest to you. Today I am taking a break from our 2005 travel story to talk about our trip to Joe's Crab Shack on Sunday. 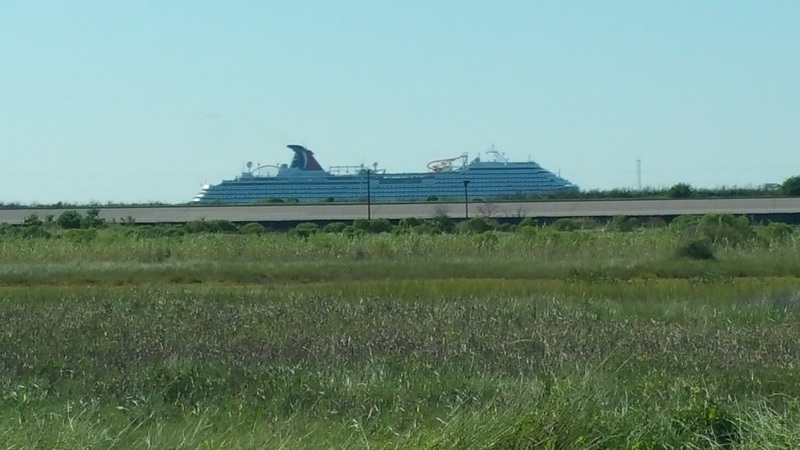 Kathi and I have suspended our RV travels for the time being to manage some family issues. We are parked at the Green Caye RV Park in Dickinson. We have been spending a lot of time during the week assisting Kathi's brother, Larry Clark in his battle against leukemia. We take him to Methodist Hospital on Mondays and Thursdays for blood tests and medical infusions. Other days during the week we are staying with Larry at his home, so we can administer sodium chloride – magnesium infusions. His wife, Andrea works during the week and spends weekends with Larry, so our help is not necessary. 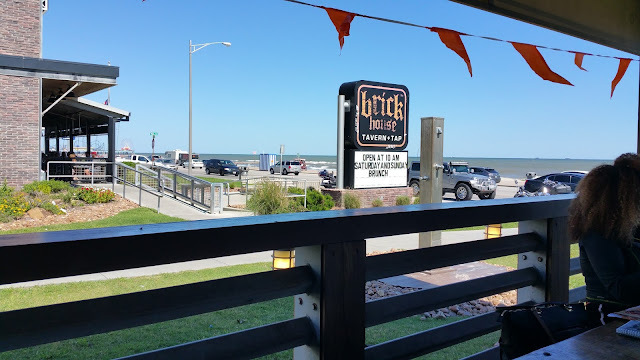 Yesterday was Sunday and Kathi and I decided to drive to Joe's Crab Shack in Galveston for a late crab lunch at Joe's seawall restaurant. We ordered a Joe's Classic Steampot for two that featured queen crab, snow crab, boiled shrimp, smoked sausage, corn on the cob and red potatoes. We chose to sit on the patio and feel the cool breeze while we ate. The patio was a great choice. 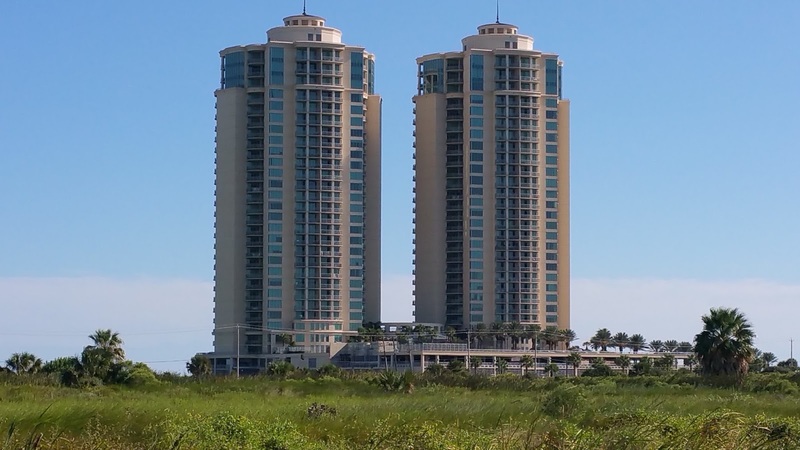 We got to watch people walking along the seawall, beach patrol officers giving parking tickets, people riding peddle cars and we could watch the waves on the water from our table. 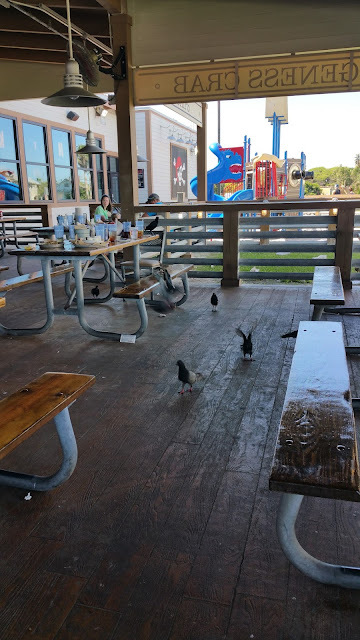 We even got to see the black birds and pigeons fight over left over food at other tables on the patio. I usually muss my shirt, so I tried to wear the plastic bib that Joe provided. The wind was blowing so hard, I could not keep the bib on, so my shirt had to take its chances. Our waiter was named James and he told us he was known at the restaurant as Mr. Personality and I believe him. He was fun and efficient. We have not driven to Galveston in several years and it has always been one of my favorite places. I remember being on Stewart Beach when I was in elementary school and staying in the water until dark. Kathi used to like to go the beach when she was younger and loved being there. She does admit to hating the drive home covered with sand and salt and I do not blame her. One summer day soon after we got married, Kathi and I drove our convertible to Galveston, spent the day swimming and playing in the sand, then drove home with the top of our car down. We spent the next two days in bed with sever sunburns. I remember even the top of my feet hurt. We only made that error once. After lunch we drove the seawall from Joe's and saw most of West Beach. We returned down the seawall, all the way to East Beach. It was a great afternoon with a good meal, great visuals and good conversation among best friends. brick house next door to Joe's. Birds looking for lunch on Joe's patio. 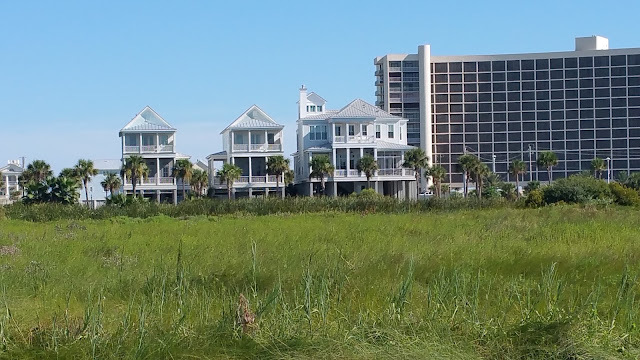 Beachtown Condos in front with Galvestonian hotel behind. LG and I need to get down there and take you guys to lunch. I've been waiting for a bit cooler weather. Great BLOG, Arlon! Thanks for reading my blog, Pete. Looking forward to seeing you and Linda.